Originally, interior design was integrated as part of the building process. The concept of interior design as a distinct art and profession was not included. In today’s world interior design has become an important aspect for any building so that it is pursued as a separate discipline. Interior design refers to the various developments related to making the interior space a better place in terms of comfortable settings for various human activities. The rooms are decorated in accordance with the requirement and taste of customers. To achieve this, color becomes an integral part of interior architecture. This paper investigates the development of interior design and how color perception has been associated with it from the historical times to the postmodern times that we are living in. Interior design aims at turning the interior space into an attractive setting and involves all aspects including windows, doors, floor, walls, furniture, lighting and color paints etc. Interior design has gained popularity because people pay attention to how their homes, offices or business environment look like. Interior designers must be able to decorate a given space using all the required demands while making the space look beautiful and pleasing. The design and construction of buildings have always relied on the ability of an architect to graphically visualize and present their ideas using a variety of different media. Architects formulate and refine spatial, artistic, and functional concepts through drawings, sketches, and models, whereby they rely on their personal artistic skills and preferences to accomplish this. During the period when new architectural advances were implemented, the development of architectural design also took place. For example, the structural design of Duomo also refers to the advanced interior design of the building. This advancement in arts and architecture was aimed at revolutionizing the world of architecture. The Italian architectural design advancements in the late 13th century and early 14th century such as Brunelleschi’s work in Santa Maria del Fiore’s interior design played a pivotal role in liberating architecture. Architecture was liberated from the technological and aesthetic constraints that had been imposed by Gothic traditions. His distinguished invention of linear perspective introduced a new method of architectural representation of three-dimensional space, opening up new venues for artistic and architectural expression to date. The Neo-Classical era dubbed as the “The Enlightenment” or “The Age of Reason” emerged in the mid 1700’s and continued up to around 1830 when it was replaced with the Romanticism era. It was part of Greek and Roman history. The Romanticism era which was dubbed as “Art with a Heart”, started around late 1700s and continued until mid-1800s. This was the first time in the history of art that art started to focus on teaching people to care about one another. The Neo-Classical art era like many other historical art periods had evolved from a previous art era in the form of a rebellion. The Neo-Classical era had rebelled to the former Rococo era. Rococo art was characterized by playfulness and a sense of being whimsical. These art eras have distinct values and characteristics that define them. The political, social and historical aspects also had an influence that helps us understand the role such avenues played in the development of artwork. This paper investigates the emergence of the Neo-Classical art era and evaluates how perception of color in this age has helped to shape today’s perception of color. Artists have been very vocal in demonstrating their perception of color. One of the characteristics of neo-classical art era is that writers and theoreticians were the initiators of this art movement. The Neo-Classical use of color was characterized with calmness and rationality. They stressed drawings using lines with no color or trace of brushstroke. The Romanticism era is similar to the Neo-Classical era in that both eras endeavored to express freedom, societal values, and religions through paintings. The Romanticism era is the era that has played the most significant role in shaping the modern day perception of color. “Art with a Heart” is the name that was given to the Romanticism art era. One of the notable aspects of the paintings of this era is that artists used to express their emotions through painting. Artist started to paint what they wanted as opposed to what they were asked to look at and paint. They experimented with their factual perception of color, which is a characteristic that has had an impact on today’s perception of color. Artists could paint their feelings even when they did not paint the real things. This era emphasized imagination rather than real events, objects, or scenes; a core aspect of the Neo-Classical era. Neo-Classicism was coined out of rejection of the late Baroque and Rocco. These two artists desired a style that could express serious moral ideologies such as patriotism, honor and justice. Neo-Classical artists desired to bring back traditionalism and the magnificence of Ancient Greece and Rome. Neo-Classicism advocated for education through artistic work. Its main agenda was to spread enlightenment and knowledge. Romanticism was a result of Neo-Classicism. Romantic artists mainly wanted to set an example in the expression of emotions, both stormy and subtle. Romantic Movement embraced a number of themes such as nature, historical nostalgia, social injustice and supernatural elements. Religion influenced the perception of color in the pre-historic times such as in the Neo-Classicism and Romanticism eras described in this paper. Neo-Classicism architects drew most of their inspiration from the classical forms of Baroque which were practiced in England. Architectural design was integrated with the structural design of the buildings. One of the architects who were inspired during this period was Sir Christopher Wren who designed the St Paul’s Cathedral. Examples of Neo-Classicist famous buildings include: The Arc de Triomphe designed by Jean Chalgrin (Paris), the Pantheon planned by Jacques Germain Soufflot (Paris). Neo-Classicist artists also relied on classical antiquity for motivation, and stressed the intrinsic worth of heroism, gravitas and duty. Leading promoter included Jacques-Loius David, a French artist, Anton Raphael Mengs, a history painter and Jean Auguste Dominique Ingres, a French master of academic art. The unifying theme of the interior design of the Pantheon, for example, is represented by the circles and squares forming the building. The checkerboard floor pattern is different from the concentric circles design of the square coffers located in the dome. Each section of the interior, starting from the floor all the way to the ceiling is subdivided into different schemes. This divides the interior into decorative zones to unstreak. The overall effect of the Pantheon is direct viewer orientation from the major part of the building’s axis. In the courses, Josef Albers primarily shared with his students the experience before he taught them rules. Albers prompted his students to see color. Once his students attested that they saw the color, he would then introduce them to the system of color theory or pigment mixing. By compiling the answers to his classroom volumes collection of colors, Albers shares this experience with the post modern world so that we learn how to interact with color. Albers approach to teaching originated from a powerhouse in Germany where he both studied and taught. After the closure of the powerhouse by the Nazi in 1933, many powerhouse artists fled from Germany and Albers became the director of it. He published the Interaction of Color in 1963, as a screen printed edition of 150 color plates. In Interaction of Color, Albers says that his book does not follow an academic perception of theory and practice, but rather that it reverses the order and puts more emphasis on practice rather than theory; he states that it is also the conclusion of practice. Albers encouraged his students to write the answer because he argued that by doing so he would prevent the students from finding the answer. Albers’ book deals with color illusion or what is referred to as color relativity. He says that it is practical to distinguish between actual facts and factual facts. Factual color refers to how we name, measure or locate color. This is how we view color in isolation. Actual color is how color appears to us in the context as it evidently does in the real world. The difference between the two terms is that factual color is theory and rule based while actual color is practical and based on attempts and mistakes. Factual color is fixed while actual color is fluid. Factual color is absolute while actual color is contingent; factual color is isolated while actual color is integrated. Factual color has always been the focus of historical color theory in the art industry, science and design. For example, spheres of color have created color spaces, color shapes or cool solid from which we can locate and specify every imaginable color. 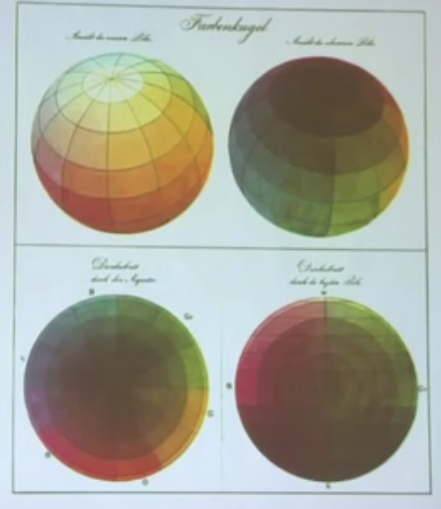 Phillip color spaces originated in 1810 show both the surface of the sphere and the vertical and horizontal cross sections. 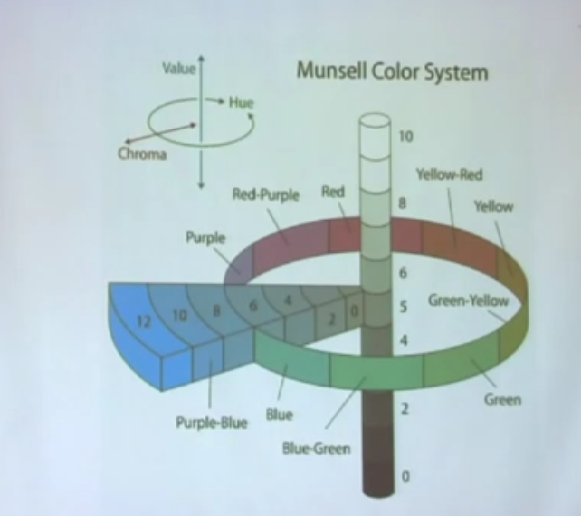 Albert Munsell color sphere was established in 1900 and used the three properties of color, namely hue, value and saturation as different axis of the color sphere as reflected in the image above. Munsell color sphere is still used in some industries today. Source: Josef Albers, Interaction of Color: 50th Anniversary Edition (New Haven: Yale University Press, 2013). CIE 1931 chromaticity color space is a triangular color space that was developed in 1931 as color of light. 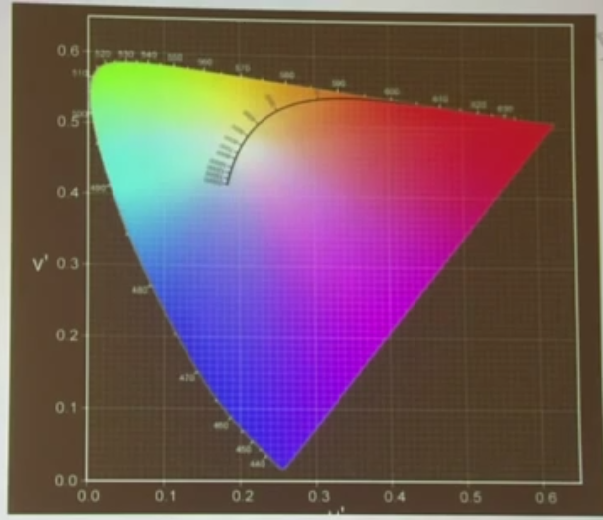 It shows that RGP color model is now used in color screen such as in color television. Each end of the triangle holds each of the primary colors of light namely blue, red, and green and the other colors are located as representatives of these three primary colors. While factual color has been so entrenched in the color theory, ironically interaction of color is about how we percept color on a daily basis; I have a green shirt, my favorite color is blue etc. Actual color, on the other hand, has been mostly utilized in the realm of philosophers, most notably Wittgenstein and Goethe, teachers and artists among others.Notwithstanding, Albers was the figure that systematically demonstrated elasticity of color. Albers also talks of the limitation of language in describing color; this is because color is extensive while the language is limited. Rudolf Steiner developed the Waldorf educational system in 1919. This system presents a holistic learning approach that encourages the development of mind and spirit. The philosophical and spiritual roots were instrumental in shaping Steiner’s philosophy of anthroposophy, art Eurhythmy form and Waldorf ideology. Waldorf school serves is a pinnacle of school of art that integrates practical learning styles not only in the extra-curricular activities but in all of its subjects. Waldorf education was established in Germany initially as a school for children of the workers of a cigarette factory in Germany. The stipulations of Waldorf teaching style were simple where teachers strived to approach teaching as art. In addition, teachers incorporated spiritual and physical development of the students in their teaching. Today there are over 160 Waldorf schools in the United States and about 1000 schools worldwide. Steiner’s formation of Waldorf education and Anthroposophy were inspired by the early 20th century ideas of German Romanticism. The German Romanticism, on the other hand, had been greatly shaped by the Romanticism era of 18th and 19th centuries. The spiritual interconnection of the era prior to German Romanticism that extended to that period around the beginning of Modernism and their manifestations of Eurhythmy had a big impact on Steiner’s work. The argument of this paper is that Steiner created Waldorf education and Anthroposophy from the inspirations and context of his philosophical predecessors, some of which have been mentioned in this paper. Rudolf Steiner then became part of the generation that represented a transition from the German Romanticism to the modernity era in the early 20th century. Modernity gave way to post modernity which was characterized with a new form of art education such as the one developed by such famous figures as Josef Albers. Steiner states that Anthroposophy aims at understanding the spiritual world and integrating it into our thoughts and ideas, then into our feelings, perception and will. Personified by this spiritual context, it is easy to explain the Anthroposophy of artists today where their artwork speaks to viewers in a number of different ways. Some express the ideas and thoughts of the original artists while others create reflections of the subjects captured in the art. These artworks try to convey the personal stories and events that have transpired through the years into the lives of either subjects or the artists. Today’s artwork conveys religious, cultural and educational offerings that have been expanded over the years in response to the people’s needs and desires. Many paintings invite the viewers to ponder over their personal experiences. Today’s exhibitions are characterized with collections of artworks assembled from ancestral photos that create visual narratives on philosophical, religious or cultural issues. Some artworks today explore various religious iconography features while others are focused on specific subjects, compositions and techniques employed by the artists’ spiritual works. These are products of an emerging research that the exhibitions seek to promote. This new research simply seeks to illuminate how artworks were and still are, applicable as models of moral behavior and celebration of the life of holy figures as well as a plea of people’s hopes both in the present life and in the afterlife. This is what the research seeks to promote. This is a spiritual connotation captured in today’s artwork that evidences the far-reaching art education influence of the twentieth century such as the works of Steiner and Albers. 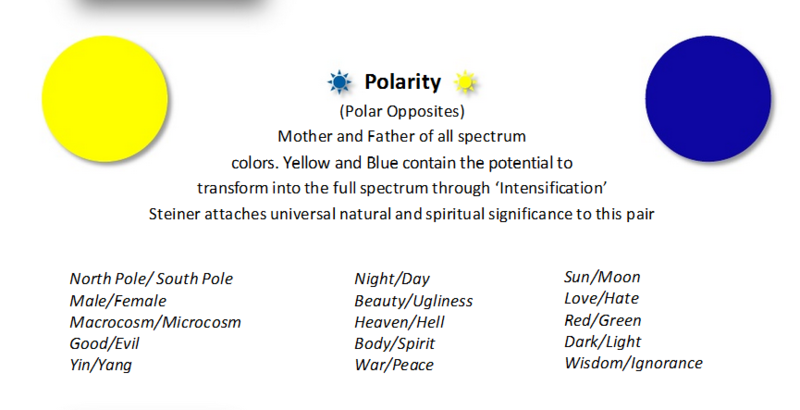 In conclusion, Rudolf Steiner in his color theory brings the concept of color being directly related to the human’s soul. On this basis, it is possible to develop a science based color foundation to help us understand the roles that color plays in therapy and education as well as in the modern artistic world. Steiner attaches spiritual and natural significance to the polar opposites in the context of interacting with color. He says that both blue and yellow have the potential to transform into a full spectrum through the process he refers to as intensification. In the early 1900s, people put confidence in knowledge with expectations that it would bring peace. However, in the 1940s with the outbreak of World War II and its aftermath, disillusionment emerged and post modernity was born. Post modernity is a concept that views things in a relative way. It states that everything is relative and asks the question, what does it mean? Post modernity has been impacted by globalization for example by the growth of technology and making choice among others. In the world of art in the sphere color theory, a fascinating principle that relates to post modernity is color relativity. Something that is relative means that something is subject to change depending on some variables. For example, one day when I bought a container of color to paint some wall in our home, the color appeared different on the wall than it was in the container. This is an example of color relativity. One of the ways that color can be demonstrated is through the principle referred to as color relativity. This is where color is subject to change depending on the background color. A background color affects the foreground colors in very specific ways through ground substration. Color that a person selects for interior design is an important decision because it has an impact on the customer. It is important to note that the color that a designer selects from paint samples may appear different from the color that the consumer had requested. Color is one of the most essential elements of design in today’s environment. Therefore, it is important for consumers to know about the impact that color selection can have on the desired outcome. Colors are not similar in their appeal or influence and when a person specifies their color selection, great care is required to ensure compatibility with the specified color hue preferences. Understanding the relationship between the interior features and color preferences is important because it creates a harmonious environment between the various inhibiting personal complexities in the living space. One of the ways of achieving that harmony is by selecting colors that are endowed with positive aesthetic appeal. It is important to note that color can be selected from paint samples that can be deceptive and misleading because they can often appear different after they have been used for painting the room. This is what makes the identification of preferred colors to be a difficult task especially for the customers. This is the reason that consumers should be assisted in making a color choice. In order to assist the consumers with the right color selection, it is important to train interior designers and engage them in this process. Alternatively, interior designers who are trained can be deployed to take the responsibility of representing the core colors required for the interior design. Training on interior design has traditionally included techniques such as mechanical drawing, building models and sketching. Each of these models represents the designer’s effort to maximize their ability of perceiving a finished product and exercising that perception. Black and white presentations have traditionally been accompanied by materials such as paint samples for planning new creations or renovating the existing color spaces. It has been reinstated that doing that provides an initial visualization of the color scheme in a more conscious way than selecting from merely a color paint sample. As it would appear there are numerous available decisions pertaining to choosing colors that a person can select from. Many decisions that are made for the interior design are often made after the reviewing of a myriad of colors of paint samples. In interior design as far as color is concerned one should take into account the works of Rudolf Steiner (1861-1925). Art in Modern age was characterized by dramatic and bold paintings. Artworks created during this time depicted increased exoticism, heroism, nationalism and individualism. Environment played an important role during this time since various artists painted portraits of long-distance fascinating places or landscapes. The Modernism age valued the intellect, reason, rationale, balance and order. Artists during this period believed that paintings were meant to spread knowledge as well as enlighten people. However, with post modernism, certainty of enlightenment depictions were rejected. Forms of art, literature, architecture, religious faith, social organization and philosophy became relative. However, a new form of approach to artwork was developed by philosophers such Rudolf Steiner and Josef Alber that has redefined our understanding about color perception and their application in artwork.